I had bought some puff pastry for a recipe that I had found in a magazine, I had found the recipe while waiting for an appointment. But when it came to making the recipe I wasn’t quite sure how the recipe went and I hadn’t written anything down. So I had puff pastry sitting in my freezer waiting to be used, but wasn’t quite sure what to do with it. Then last week we went to a family reunion on Mike’s side and there was some delicious Danish. My problem was solved. I decided on Danish after seeing how delicious the ones looked at the family reunion. 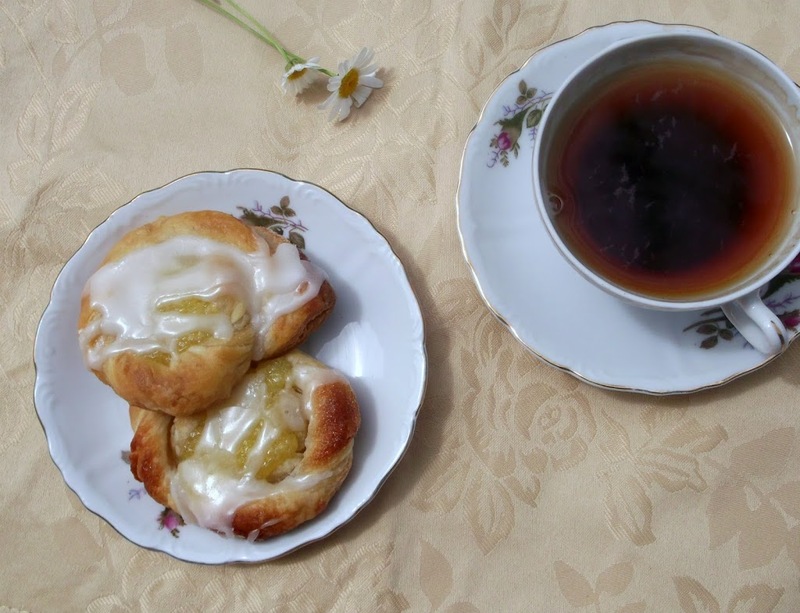 Using puff pastry has to be the simplest way to make Danish. I was surprised to see how nice the Danish turned out. This is the first time that I have used puff pastry so I really had no idea what to expect. As I said the Danish turned out to be delicious; I would say they were as tasty as the ones that were at the family reunion that came from a bakery. I love anything when it comes to lemon and decided to go with that for the filling. I found a simple recipe for lemon curd on the internet (the recipe will follow), but for a simpler way you could use canned pie filling. I wanted to say if you don’t see me around as much as normal it is because we have my father-in-law visiting for a little over a week from Florida. So I really want to spend as much time with him as I can since I don’t get to see him too often, but I will be sneaking away once in awhile to visit the blogging world. 1. Heat the oven to 375 degrees F. Grease a baking dish. 2. Sprinkle the flour on the working surface. Unfold 1 pastry sheet on the works surface. Brush the pastry sheet with half the butter. Sprinkle generously with the granulated sugar. With the short side facing you, cut the pastry sheet lengthwise into 6 strips. Repeat with the remaining sheets, making 12 in all. 3. Twist 1 pastry strip then coil into a spiral. Place the pastry onto the baking sheet. Brush the end of the spiral with the remaining butter and tuck tightly under the bottom of the pastry. Repeat with the remaining pastry strips. Place 1 teaspoon of lemon curd mixture in the center of each pastry. 4. Bake for 16 to 20 minutes or until the pastries are golden brown. Let the pastries cool on the baking sheet on a wire rack for 5 minutes. 6. Drizzle with a vanilla icing. In a metal bowl or on top of a double boiler, mix eggs, lemon zest, lemon juice, and sugar until blended. Place the bowl over a pan of simmering water and cook always whisking to prevent lumping. When it is nice and thick remove from heat and add butter in small pieces. Mix well till butter has melted and lemon curd is smooth. About a 3/4 cup of confectioner’s sugar, a dab of butter, a dash of salt, dash of vanilla, and hot water. Put the sugar, salt, butter, vanilla into a bowl stir enough hot water into the mixture to desired consistency. Oh! 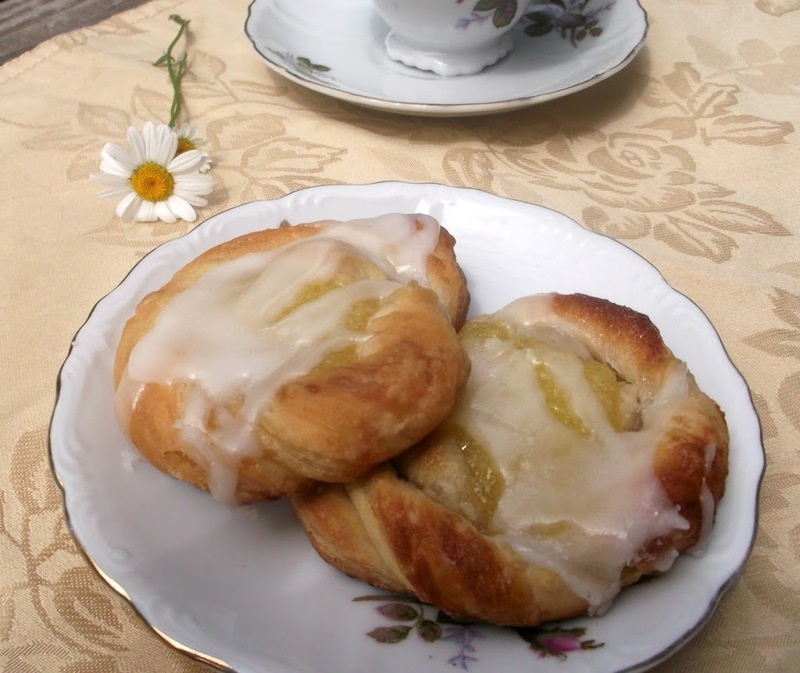 Such a great idea using the ready dough…this way it is easier and simpler…love the lemon curd…it sure makes a great breakfast item. Your lemon pastry looks delectable! I love the homemade curd! Have a great week and enjoy your visit! I really adore lemon curd, especially homemade. 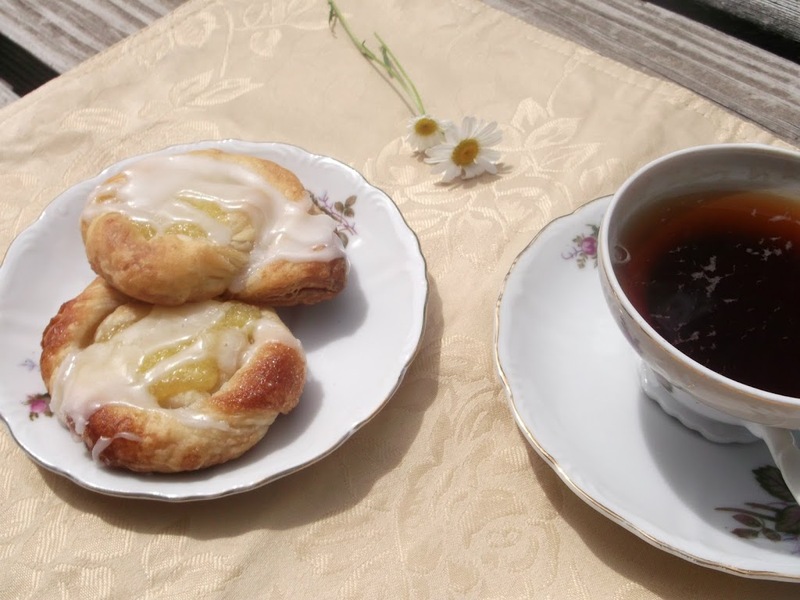 These danishes look fantastic – perfect for a leisurely weekend morning cup of coffee.